Collection contains 155 photocopied pages containing titles and texts to approximately 55 folk and cowboy songs, poems and ballads contributed to the Western Folklife Center in 1999 by Jeane Muschetto of California (donor retained originals). The sheets include titles to 175 songs, with words to 55 of those, as written out by hand by unknown persons at an unknown time, possibly the 1930s. The songs, in numbered volumes, were found in the estate of Mrs. Muschetto’s mother. 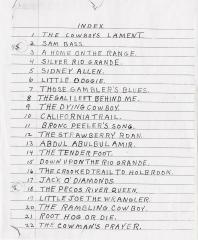 The Western Folklife Center has the contents listing for all the volumes, but song texts for only Volume 1. Collection does not contain melodies. All pages have been scanned. A checklist of the titles and texts is available.